I have come to the conclusion that there are no accidents or coincidences in life. I believe we are exactly where we are supposed to be doing exactly what we are supposed to do—even if the path is not always totally clear in the moment. So when I started noticing that gratitude and gratefulness kept coming up a lot in my thinking, in the grace I offered at lunches at Academy, in my meditation, I decided there had to be a reason. There were several seemingly unrelated things that came to mind. My own battle with shingles and my gratitude that they were waning, if not totally gone. My gratitude for all of the support from Lifespan participants and their friends and families, both emotionally and financially. You really have been amazing with your contributions. 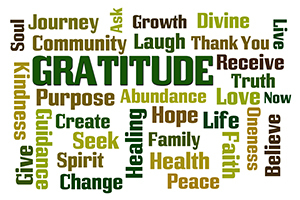 The excitement of seeing new people participating in the academy and new courses and presentations coming into the lineup.But this still did not seem to totally explain why gratitude was so present in my heart lately. Why was it popping up around me. And why was it creating such feelings of joy? I started to think about the items of value in my life for which I am grateful. All of you, of course. My brother’s continued good health. The opportunity we have to gather and nurture each other, even as some of our family have left us. Then there are the things that seem obvious, but are easily forgotten. The song bird, the blue sky, the cool breeze. Norma’s painting of walking in the rain that I couldn’t resist. But gratefulness is a choice and it takes practice, as do all things of value. Brother David provides a set of steps for us to follow if we wish to engage in grateful living. Stop. Look. Go. Stop and “wake up to the surprises around us.” I use an app called Headspace for my meditation (Of course I do, right) And the first step in every session is to stop and listen to all your sense. Then, you look. You are aware of your opportunity. As Br. David describes it the opportunity to enjoy. Whatever it is, wherever you are, whatever the experience. Notice, enjoy, acknowledge. But the last step in Br. David’s process intrigues me. Go. Take advantage of the opportunity. Go with what you have found and truly experience it. I know that I am grateful for all of you and the community of Lifespan. Br. David references an e e cummings poem in the title of one of his books. I am through you so I. “This sums up the author’s belief. I become who I am through you.” Stop. Look. Go.